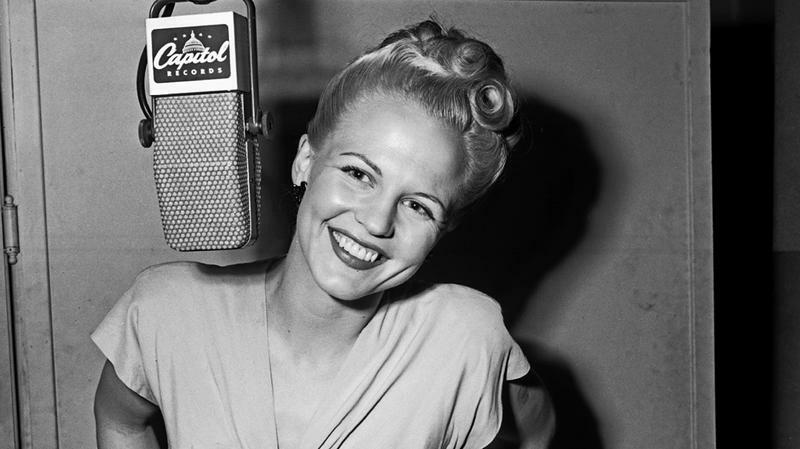 Peggy Lee - "La La Lu"
Norma Deloris Egstrom, known professionally as Peggy Lee, was an American jazz and popular music singer, songwriter, composer, and actress, in a career spanning six decades. From her beginning as a vocalist on local radio to singing with Benny Goodman's big band, she forged a sophisticated persona, evolving into a multi-faceted artist and performer. During her career, she wrote music for films, acted, and recorded conceptual record albums that combined poetry and music. In 1942 Lee had her first No. 1 hit, "Somebody Else Is Taking My Place", followed by 1943's "Why Don't You Do Right?" which sold over 1 million copies and made her famous. She sang with Goodman's orchestra in two 1943 films, Stage Door Canteen and The Powers Girl. In March 1943 Lee married Dave Barbour, a guitarist in Goodman's band. Lee said, "David joined Benny's band and there was a ruling that no one should fraternize with the girl singer. But I fell in love with David the first time I heard him play, and so I married him. Benny then fired David, so I quit, too. Benny and I made up, although David didn't play with him anymore. Benny stuck to his rule. I think that's not too bad a rule, but you can't help falling in love with somebody." ...when she left the band that spring , her intention was to quit the footlights altogether and become Mrs. Barbour, fulltime housewife. It's to Mr. Barbour's credit that he refused to let his wife's singing and composing talent lay dormant for too long. "I fell in love with David Barbour," she recalled. "But 'Why Don't You Do Right' was such a giant hit that I kept getting offers and kept turning them down. And at that time it was a lot of money. But it really didn't matter to me at all. I was very happy. All I wanted was to have a family and cling to the children [daughter Nicki]. Well, they kept talking to me and finally David joined them and said 'You really have too much talent to stay at home and someday you might regret it.'" She drifted back to songwriting and occasional recording sessions for the Capitol Records in 1947, for whom she recorded a long string of hits, many of them with lyrics and music by Lee and Barbour, including "I Don't Know Enough About You" (1946) and "It's a Good Day" (1947). With the release of the US No. 1-selling record of 1948, "Mañana", her "retirement" was over. In 1948, Lee's work was part of Capitol's library of electrical transcriptions for radio stations. An ad for Capitol Transcriptions in a trade magazine noted that the transcriptions included "special voice introductions by Peggy." In 1948 Lee joined vocalists Perry Como and Jo Stafford as a host of the NBC Radio musical program The Chesterfield Supper Club. She was a regular on The Jimmy Durante Show and appeared frequently on Bing Crosby's radio shows during the late 1940s and early 1950s. She recorded a popular version of "Fever" by Little Willie John, written by Eddie Cooley and John Davenport, to which she added her uncopyrighted lyrics ("Romeo loved Juliet," "Captain Smith and Pocahontas"). Her relationship with Capitol spanned almost three decades aside from a brief detour (1952–1956) at Decca. For that label she recorded Black Coffee, one of her most acclaimed albums and had hit singles such as "Lover" and "Mister Wonderful". Lee was nominated for twelve Grammy Awards, winning Best Contemporary Vocal Performance for her 1969 hit "Is That All There Is?" In 1995 she was given the Grammy Lifetime Achievement Award. She could entrance you, make you laugh, and then make you cry all in the same song. A renaissance woman if ever there were one. With a smile that could light up a room and voice that asks you to turn the lights down, she was the kind of star they just don’t seem to make anymore. So today, with a little stardust falling from my pockets, I choose Peggy Lee’s "La La Lu" from Disney’s “Lady & the Tramp” as my, find your own magic, sweep up all your broken pieces, something new can be beautiful, song for a , beginnings always come disguised as endings, it never hurts to dream, I hope for you so many good things, Tuesday. Laura Nyro - "It's Gonna Take A Miracle"